(16-minute read) Even if you think you know all about the Chagos story – an entire population forcibly removed from their island homeland at British gunpoint to make way for a US Air Force nuclear base, the people dumped destitute over a thousand miles away, their domestic animals gassed by the British army, their homes fired and demolished – then I beg you still to read this. Finally, of course, there is the point that this is not only a historic injustice, but the injustice continues to the current day and continues to be actively promoted by the British state, to the extent that it is willing to take massive damage to its international standing and reputation in order to continue this heartless policy. This analysis is squarely based on the recent Opinion of the International Court of Justice. The decision to empanel only 5 judges, and the selection of the UK’s three most right-wing Law Lords for the panel, was taken by the Lord Chancellor’s office. And the Lord Chancellor was now – Jack Straw. The timing is such that it is conceivable that the decision was taken under Straw’s predecessor, Lord Falconer, but as he was Blair’s great friend and ex-flatmate and also close to Straw, it makes no difference to the Establishment stitch-up. The sheer cynicism of this effort by Miliband to dress up genocide as environmentalism is simply breathtaking. If we were really concerned about the environment of Diego Garcia we would not have built a massive airbase and harbour on a fragile coral atoll and filled it with nuclear weapons. Mauritius challenged the UK to arbitration before a panel constituted under Article 287 of the UN Convention on the Law of the Sea, a Convention I am happy to say I was directly involved in bringing into force, by negotiating and helping draft the Protocol. Mauritius argued that the UK could not ban fishing rights which it enjoyed both traditionally, and specifically as part of the agreement to cede the Chagos Islands. The UK brought four separate challenges to the jurisdiction of the panel and lost every one, and then lost the main judgement. It is pleasant to note that acting for the Chagos Islands was Elizabeth Wilmshurst, the FCO Legal Adviser who had resigned her position, telling Jack Straw that the attack on Iraq constituted an illegal war of aggression. Which brings us up to the present Opinion by the International Court of Justice after the government of Mauritius finally took resolute action to assert sovereignty over the islands. Astonishingly, having repudiated the decision of the Arbitration Panel on the Law of the Sea, very much a British-inspired creation, Jeremy Hunt has now decided to strike at the very heart of international law itself by repudiating the International Court of Justice itself, something for which there is no precedent at all in British history. This is opposite as throughout the 21st Century developments listed here in this continued horror story, the Chagossians’ cause was championed in the House of Commons by two pariah MPs outside the consensus of the British Establishment. The Chair of the All Party Parliamentary Group on the Chagos Islands was Jeremy Corbyn MP. His Deputy was Alex Salmond MP. 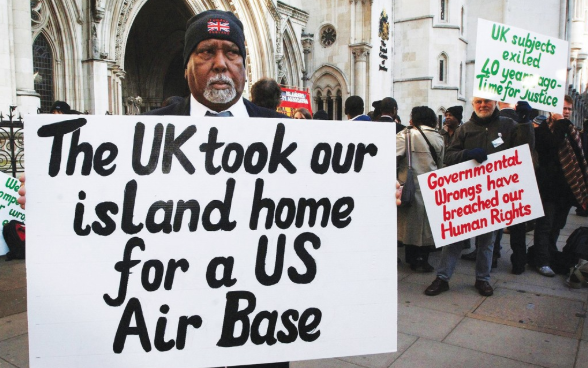 Chagos really is a touchstone issue, a key litmus test of whether people are in or out of the British Establishment. The attacks on Jeremy Corbyn, the manufactured witch-hunt on anti-semitism, all are designed to return the Labour Party to a leadership which will continue the illegal occupation of the Chagos Islands; the acid test of reliable pro-USA neo-conservative policy. The SNP, at least under Salmond, was an open challenge to British imperialism and hopefully will remain so.